Our board is comprised of many different local stakeholders who bring a great variety of experiences and skills to this project. Our board includes downtown tenants, housing managers, students, community organizers, immigrants, long-time residents, legal experts, former diplomats, tenants rights advocates, planning consultants, and city leaders. Download our by-laws to learn about our governance structure. Brenda has a BA degree in Social Science from California State University, which she earned while raising two children. Then, halfway to her lifelong goal of PhD/ psychology, she took a break from college for a midlife child, and then she returned to Maine, her birthplace, in 2003. Her first friend in Maine asked her to sew clothes in an African store off and on, and she also sews for other businesses, including native American regalia for powwows. 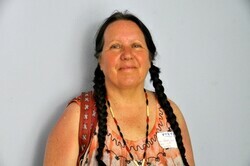 At Powwows in New England, Brenda has been sometimes controversial by carrying a flag as a female veteran. In the Army , decades ago, Brenda worked in a mental health clinic doing interviews, counseling, and was trained for drug/ alcohol therapy group co-facilitation. Brenda has learned that her ancestry includes Salem witches and the Natives who met the Mayflower. Currently, Brenda is co-chair of Maine People's Alliance Board, and a gardener with Lots to Gardens. In 2015, after fifteen years of adulthood and countless numbers of moves, Lis Janes came to Lewiston-Auburn with the intention of setting down roots. She quickly fell in love with the riches this community possesses. Lis was born and raised in mid-coast Maine. She is an artist who loves building relationships with people, and has done paid work in education, health care, and social services. She also volunteers for the Southern Maine Workers’ Center and Outright L/A. She spends her days thinking about and working toward a world where the basic rights and dignities of all are fully recognized and honored. In 2017, Lis became a proud member of the Raise-Op. In her downtime, she can often be found in her apartment working on art projects, reading, baking, or taking naps with her cats. Shaad is a proud Lewistonian who recently moved into the downtown community but has been a Lewiston resident for most of his life. He is amazed by the talent and hard-work that is displayed everyday in Lewiston and tries to help the community stay safe and healthy as a registered nurse at Central Maine Medical Center. 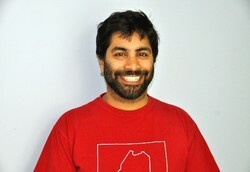 As a board member of the RAISE-Op, Shaad brings leadership, enthusiasm and a creative vision to the project. He has experience in managing rental property in Lewiston and is always working to improve his construction/handy man skills on various personal home improvements. Shaad loves giving tours of Lewiston, sharing its history with visitors and highlighting the architecture and unique features of the Twin Cities. Shaad is eager to see the cooperative empower citizens to take Lewiston and its downtown to the next level of socially conscious and sustainable living. ​Julia is consistently inspired by the generosity and gritty determination she observes among the diverse residents of this former mill town, and is proud to work alongside her neighbors toward resident-driven change. Julia was raised in Androscoggin County, and after some service-related traveling domestic and abroad she returned home, realizing the community she would be lucky to be a meaningful part of was Lewiston-Auburn. Julia has eclectic work experience, for example, previously serving as event planner and compost manager for the Dempsey Challenge, and brewery tour guide and beertender at Baxter Brewing Co. in the old Bates Mill. Her true passion, however, is community food systems improvement. Julia has worked on several local farms and currently does behind-the-scenes food system network-weaving as Coordinator of the Good Food Council of Lewiston-Auburn. She is also involved in local land conservation work as the Associate Director of the Androscoggin Land Trust. Julia also serves on the board of Grow L+A. She holds a degree in Sociology from the University of Maine. ​Stuart has raised his children and grandchildren in Lewiston. He served as a paratrooper in the US Army during the 1980’s, where he traveled around the world to 6 different continents. 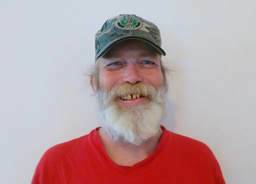 He has volunteered for the VA, helping with veteran peer support services. He is currently retired and enjoys Netflix and socializing on his porch with neighbors. He’s excited to see the Raise-Op improve units in the neighborhood. Houssein is a case manager for the Maine Department of Health and Human Services, and also works seasonally for LL Bean. He is raising a family of five happy children with his wife, Ouma. When he finds the time, Houssein enjoys playing pickle ball with friends and attending conferences about social justice.